a.k.a. Artbreak Hotel or Ye Olde Carlton Arms Hotel is located in the corner of 25th Street and 3rd Avenue on the East side of Manhattan. The 54-room, five story building has been a hotel for most of its 100-odd years. According to blueprints, there were originally two contiguous buildings put together at the beginning of this Century when, still lit by gas, the hotel clientele were mostly farmers and business men from New Jersey and Connecticut looking for a hearty meal and a warm and safe place to sleep. They were able to keep their carriages and horses in a huge barn right next door on 25th Street. During Prohibition, the neighborhood was mostly Irish working class and the new elevated subway passed right in front on 3rd Avenue. When Prohibition started and illegal boozing went on everywhere in the city, the hotel lobby was converted into a speak-easy and big money card games were played in the rooms upstairs. Later on and with the opening of a few fancy restaurants that changed the face of the hood, The Carlton Arms became a fancy and respectable hotel. But not for long. 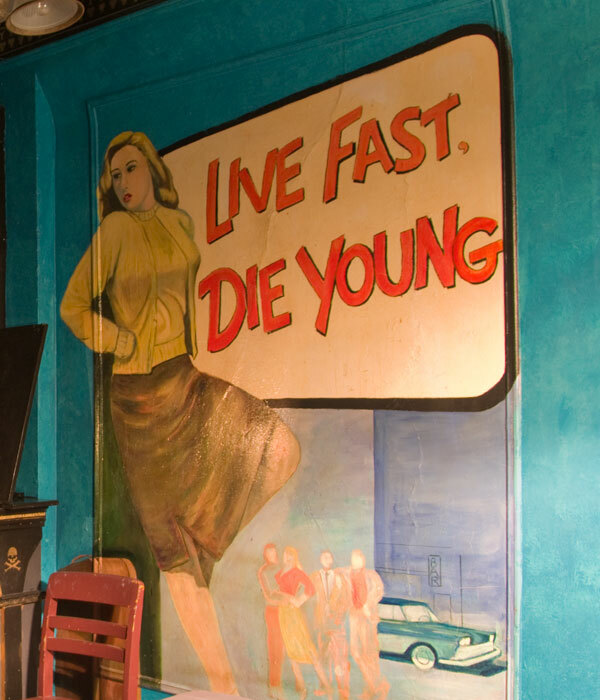 Along with the ’50s and travelers wanting hotels with private showers and amenities, the place started to turn sleazy, a hang out for drag queens, prostitutes and drug addicts. 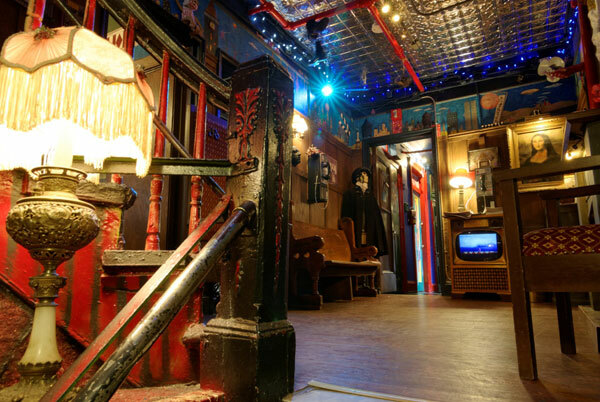 In 1984 Brian Damage, a downtown artist renowned for his beautifully executed installations at The Mudd Club, Studio 54 and Danceteria, painted “The submarine room”. Like many of New York’s smaller, older hotels, The Carlton Arms became a single-room occupancy (SRO) hotel during the ’60s and welfare recipients filled the place for more than 10 years when the program was abolished. In 1981, when the hotel’s manager had a complete nervous breakdown, Ed Ryan, back in New York from ten years of world traveling, inherited the job. “The hotel started its downward slide about 30 years ago and had reached a good groove own by 20 years ago. By the early ’80s, the Carlton Arms was full with madmen, junkies,comedians, ex-cons, pushers and hookers, transvestites, drunks and nuts of all kinds, women who beat you in exchange for your pay, a new generation of hippies and life’s lost and lonely. It was a place to bed down and indulge,” he explains. Ryan set out to break the cycle of despair feeding despair that had set in over the years of neglect. 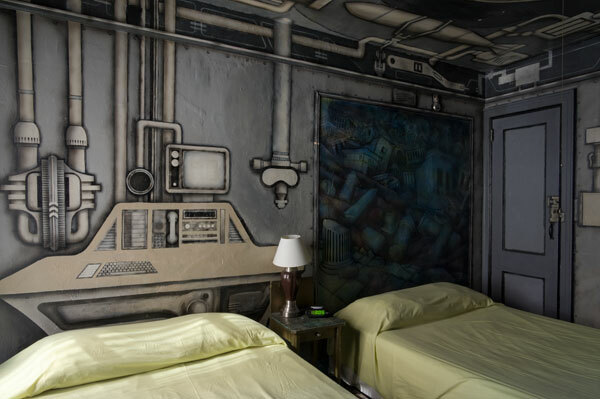 As rooms were vacated, they were no longer re-rented to welfare tenants, but instead were scrubbed, repainted, furnished with new beds and rented out to travelers and transients who didn’t mind forgoing middle class luxuries in exchange for a very low nightly rate. Mural by Colette Jennings in room 2A is one of the earliest paintings at the hotel still remaining today. 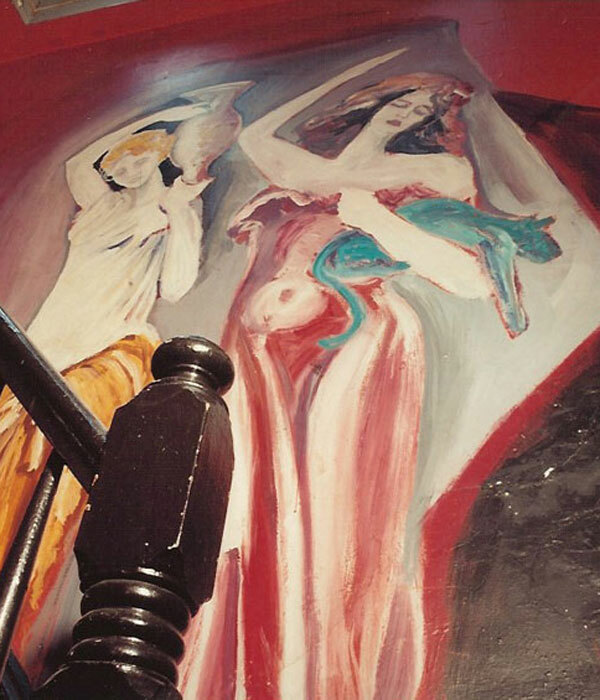 One of the very first murals along the staircase of the hotel were painted in 1983 by Gil Dominguez. Artists began to pass through the hotel and as jobs opened up, Ryan, invited several of them to work at the front desk. 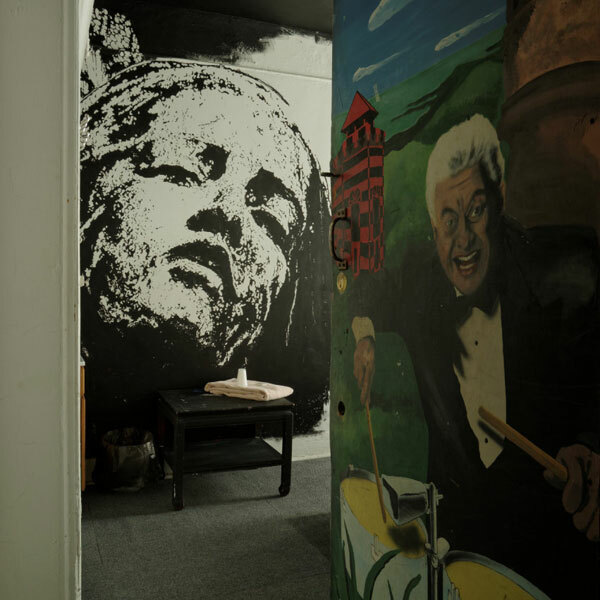 In 1983 artist and front desk clerk Gil Dominguez painted a series of murals on the five-flight staircase. Later that year, he and fellow worker Colette Jennings began paintings murals on small panels within several rooms. The art seemed a physical manifestation of the positive transformations possible within the old building. In 1984 Brian Damage, a downtown artist renowned for his beautifully executed installations at The Mudd Club, Studio 54 and Danceteria, began painting “The submarine room” and the idea for complete artist’s transformation of the rooms took shape.In the years that followed Dominguez, Jennings and Damage’s first installations, dozens of artists from all over the world, came in, brought their craft and passion and transformed the once rotten hole into an unique Manhattan site where the walls explode with color and art. Today, everyone of the 54 rooms, hallways, bathrooms and staircases are painted or decorated. But the project hasn’t stopped, is in constant evolution. Years after initial transformation, art project continues at The Carlton Arms Hotel. 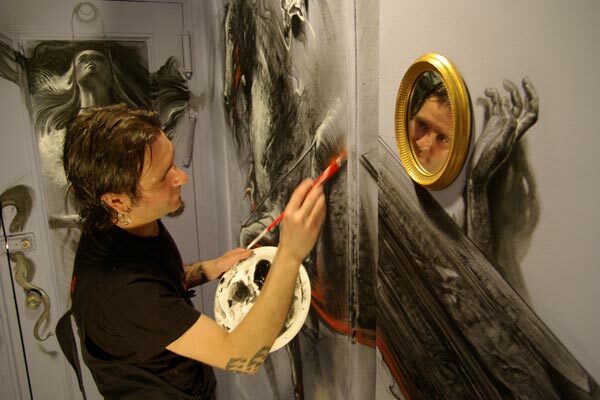 Prominent tattoo artist Robert Hernandez working in the room 15B in 2009. 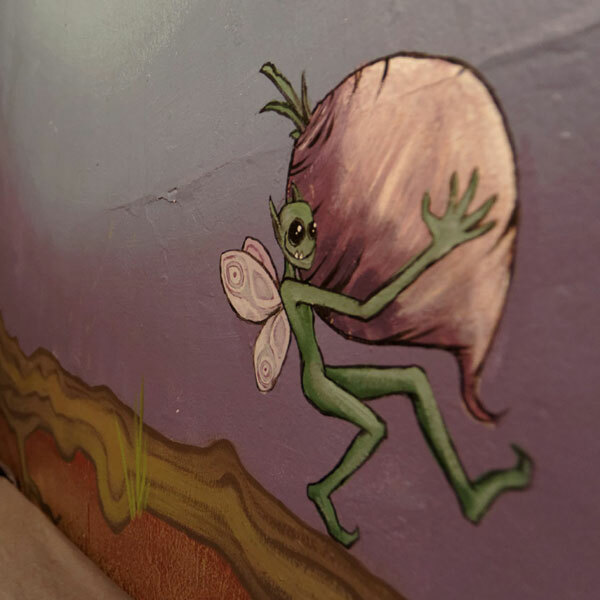 Mural by Emil Tibell room 6A.